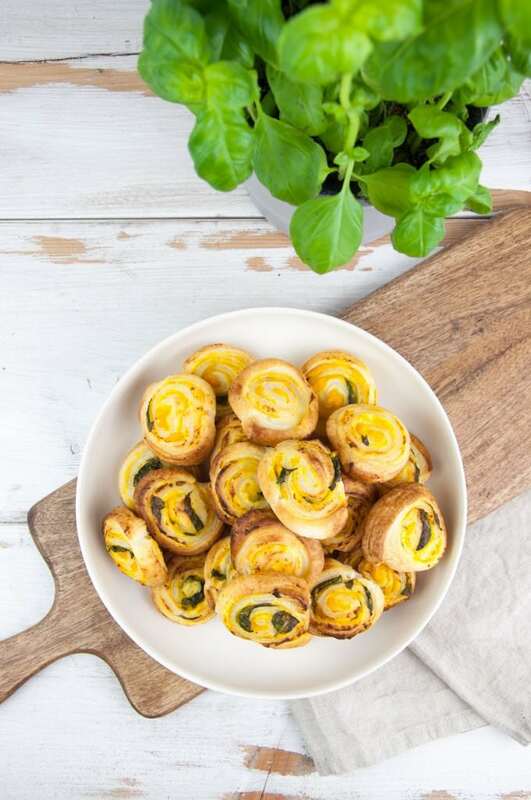 If you’re looking for a super quick and easy snack to serve at parties, then you’ll have to make these vegan Pumpkin Basil Pinwheels. They are a real crowd-pleaser and the best part is that you only need 4 ingredients to make them! 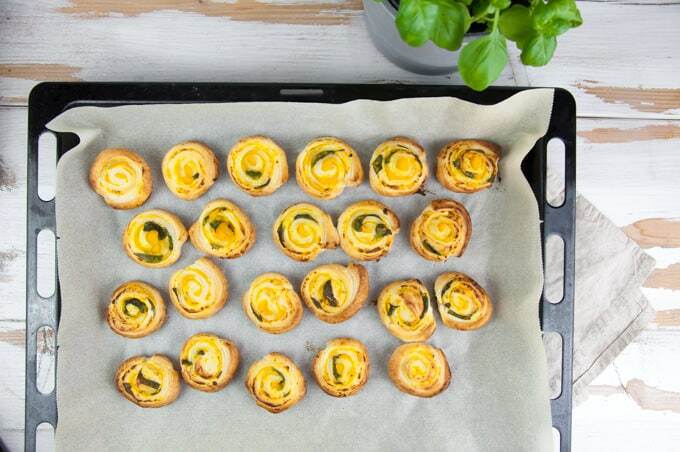 For quick and easy snacks and finger foods, I love working with puff pastry dough! 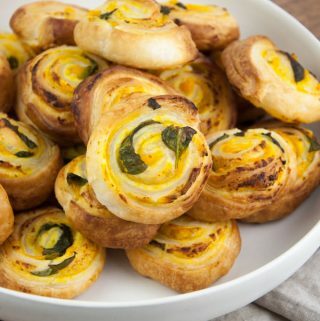 These Pumpkin Basil Pinwheels are the perfect party food because they are a real crowd-pleaser and so quick to make. They are also a great appetizer if you get a spontaneous visit! I’ve actually made these for a Halloween party and they were gone so quick! No one noticed these were vegan, which is the best compliment in my opinion! They are creamy and yummy. In Austria, most of the puff pastry doughs are (accidentally) vegan. They usually have the vegan label on the packaging, so it’s easy to spot them. In the US, Pepperidge Farm puff pastry dough is vegan (but it’s always best to check the ingredients to be sure!). Preparation: We don’t have canned pumpkin puree in Austria, so I cooked cubed pumpkin until soft and blended it in my food processor until smooth and creamy. Super easy! Of course, you can use store-bought pumpkin puree instead! 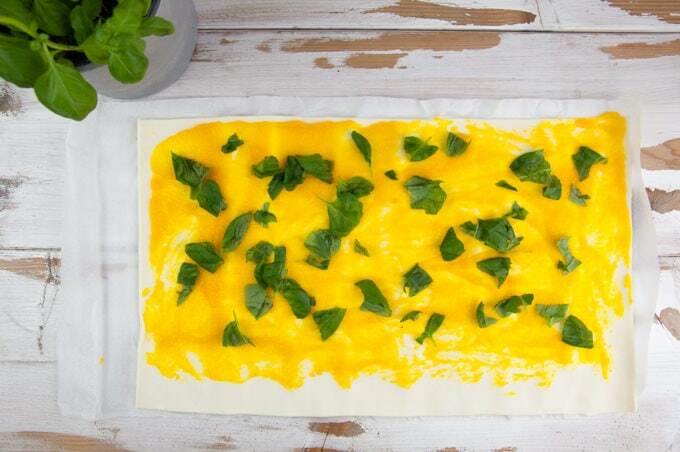 Step 1: Roll out the puff pastry dough, add the salted pumpkin purée and basil leaves. 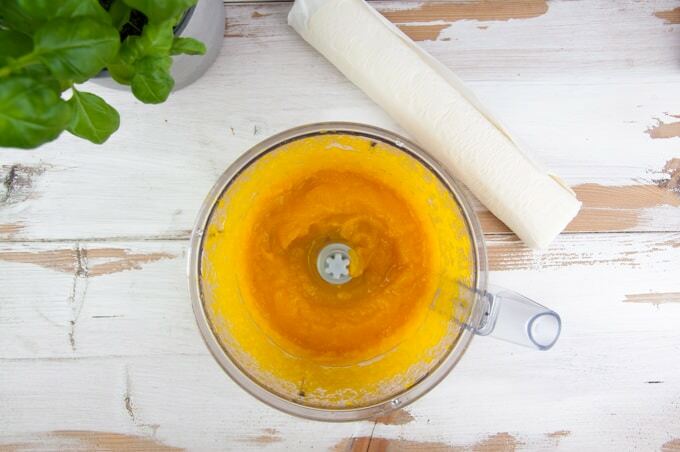 Tip: Just make sure you’re not using too much pumpkin puree or it will be really hard to roll in and the puree will leak out on the sides. Step 2: Roll it in. Close the edge by pressing it down carefully. Step 3: Cut the roll in about 25 slices. It helps if you wet the knife, you’ll be able to cut through easier! But don’t worry about the form at all, they will pop back into shape once baked. 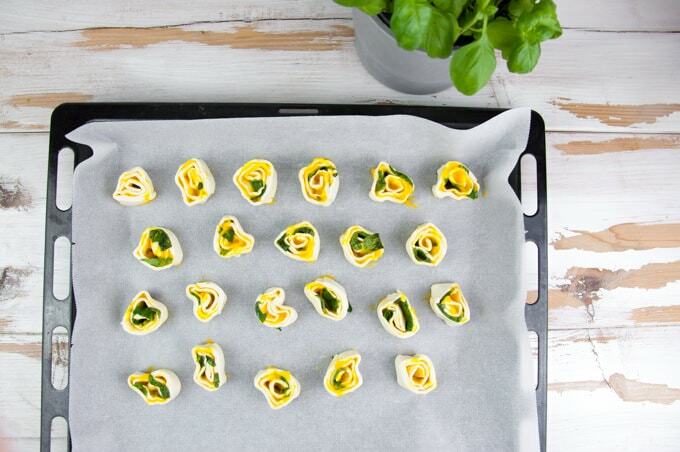 Step 4: Place the pinwheels on a baking sheet and put them in the oven for about 15 to 20 minutes. Step 5: They should get a lovely golden color! Let them cool off and serve! 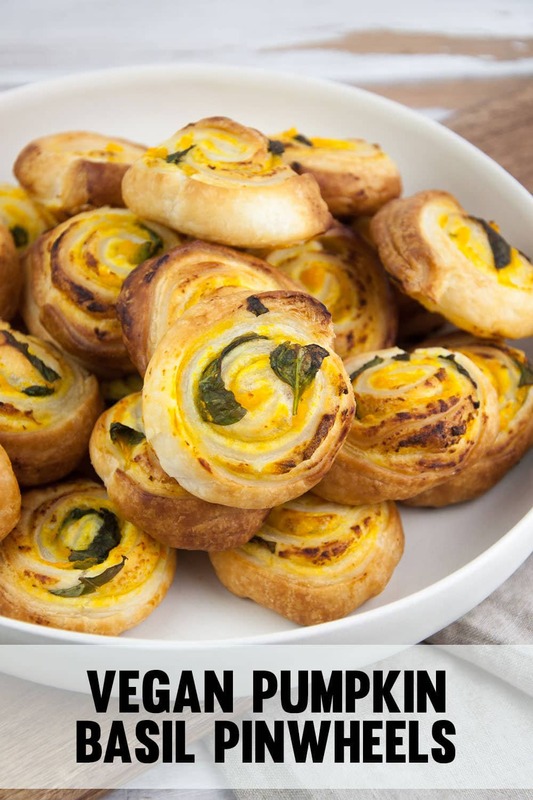 I hope you enjoy these pinwheels with pumpkin and basil as much as I do! Let me know in the comments if you make them! 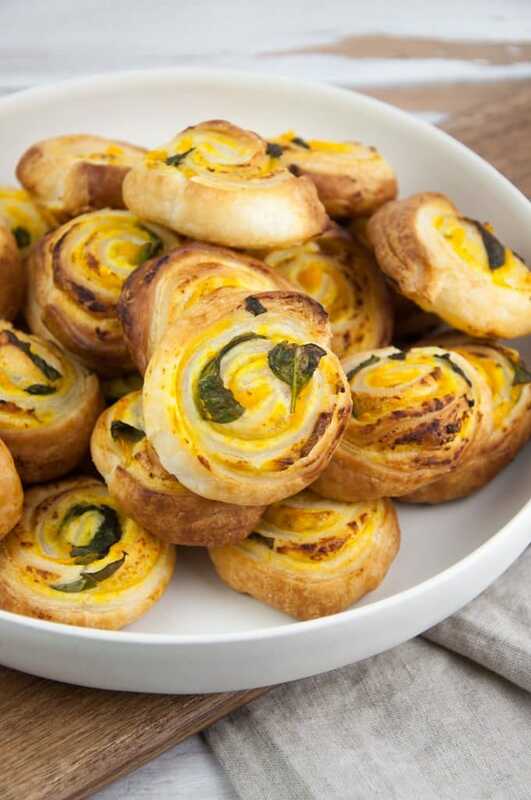 Recipe for super quick and easy vegan Pumpkin Basil Pinwheels. Made with vegan puff pastry. They are the perfect snack for parties! Combine the pumpkin puree** and salt. Roll out the puff pastry dough, spread the salted pumpkin puree on the puff pastry dough, leave out the bottom border and sprinkle the basil leaves on top. 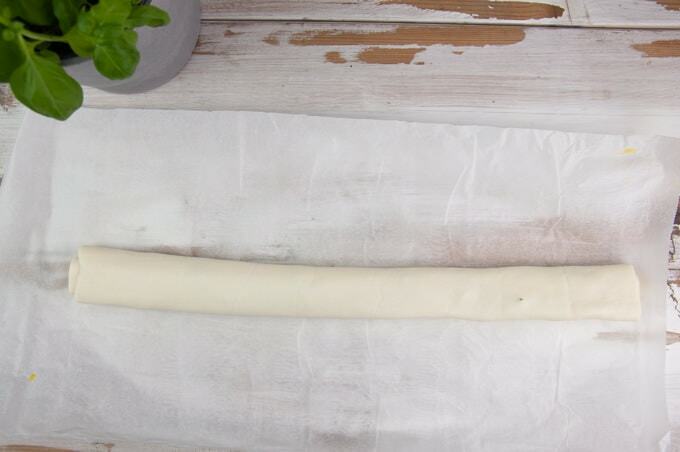 Roll the puff pastry dough in (as tight as possible) and close the edge. 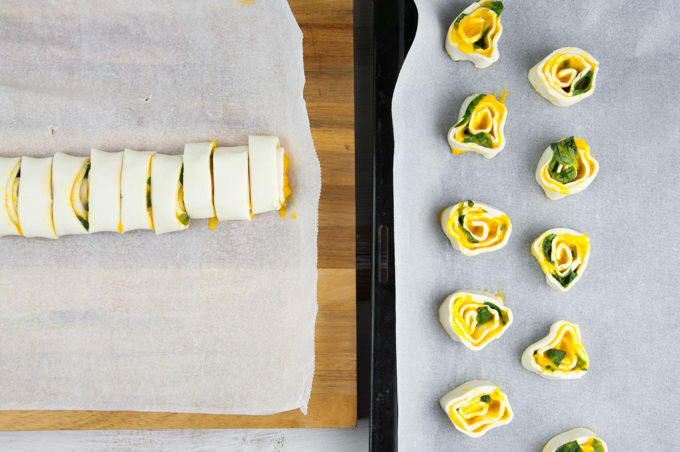 Cut the puff pastry dough roll in about 25 pieces and place the pinwheels on a baking tray lined with parchment paper. Bake for 15 to 20 minutes until golden brown. Let them cool off and enjoy! *Puff Pastry: Dimensions: 16x9 inches or 42x24 cm. Pepperidge Farm's puff pastry dough is vegan (but make sure you check the ingredients). **Pumpkin Puree: You can use store-bought pumpkin puree or you can easily make your own by blending cooked/steamed/roasted pumpkin until smooth and creamy. Just make sure you're not using too much pumpkin puree or it will be really hard to roll in and the puree will leak out on the sides. A thin layer of filling will work best. The filling should be seasoned well (salty enough) so that the pinwheels don't turn out bland. Amazing baking skills, what do you mean? :P :D Hah, but thanks Natalie! I was a bit late to the pumpkin-party but now I’m taking full advantage of this amazing seasonal produce (I’m ready when everyone else is already bored of pumpkins :D). And there will be another pinwheel-recipe coming up (which is the one I usually bring to parties). These are absolutely delicious! I added some shaved Parmesan to the tops of them before I stuck them in the oven. My older daughter who is finicky as all get out raved about them! Thanks for sharing! Ooooo :O I saw this wonderful gluten-free puff pastry, but then when I looked at the ingredients it had egg so I cried :( No pinwheels for me, but wonderful recipe! Oh. My goodness. Where can I get that puff pastry dough?! Is there a specific brand – I’ve never bought it before. I am SO making this when Fall rolls around. Chopped sage could even be good too, in place of basil! It is so easy and looks so nice. Thank you as a idea how to serve something interesting to our friends. In our country we make similar snacks ( with pesto, with tomato, also with cheese, but use pumkin and basil is great idea. I go to try it! and friends. Unfortunately I only had fresh sage on hand, which worked. These were so perfect and pretty my friends thought I bought these at a bakery. Everyone LOVED these pumpkin pinwheels. My teenage son broke out the pumpkin butter and slatherd it on his. His addition was actually tasty too. Thank you for sharing this great recipe! Hi Bianca, I made your pumpkin pinwheels for a catering job earlier this week and they turned out really nice. I also used sage and I think it is a lovey combination. I made them 1 day in advance, baked them and regenerated a few minutes in a hot oven. Worked perfectly! I also made the pinwheels with a combination of mushrooms, union, thyme and a vegan cheese ‘sauce’. This also tasted very good. Thanks for your recipe! Can these be prepared ahead of time and reheated or frozen (cut) and then baked?. I am looking to serve them at a party but need to cut down on prep time. Can these be cooked and frozen for reheating later? So cute! Do you think sweet potato would work? My gf is not a pumpkin fan (sigh). absolutely! I think that is an awesome idea! Just started trying to incorporate a lot more vegan recipes in my repertoire. I will have to check this one out since I love pumpkin. Thanks!